There is a consensus among health professionals that inflammation is not just a cause of osteoarthritis, but is a major cause of almost ALL degenerative disease. So lowering the level of inflammation will not only relieve your arthritis, but is an important contribution to your overall long term health. The first priority is to increase the amount of anti-inflammatory foods in your diet. These include fruits, vegetables and omega-3-rich oily fish. Fish high in omega 3 fatty acids include wild salmon, mackerel, herring, tuna, sardines and pilchards. Fruits with high anti-inflammatory and anti-oxidant scores include blueberries, raspberries, blackberries, strawberries, cherries and blackcurrants. High scoring vegetables include broccoli, asparagus, beets, mushrooms, chard, spinach and cabbage. These fruits and vegetables are good sources of flavonoids, and carotenoids with anti-inflammatory and antioxidant properties. Generally the more (natural) colours there are on your plate, the higher the anti-oxidant and anti-inflammatory content of your diet. The second priority is to reduce the amount of pro-inflammatory foods (and cooking methods) in your diet. Your body uses fatty acids from the food you eat to make certain important hormones. Omega 6 fatty acids – found in polyunsaturated plant oils like safflower, sunflower and corn oil – are used by the body to produce hormones that promote inflammation. Omega 3 fatty acids (from oily fish) have the opposite effect – they are used to produce hormones that reduce inflammation. Our ancestors ate a diet with a ratio of omega-6 to omega-3 of between 1:1 and 2:1, which is a healthy ratio. Today we consume foods containing far too much Omega 6 fatty acids – partly as they used extensively in processed foods, because they are cheap. As a result, the body is forced to use too many omega 6 fatty acids to build cells, tissues and hormones – and the balance in the body becomes pro-inflammatory. Use the following table to increase anti-inflammatory foods in your diet and reduce the levels of pro-inflammatory foods. Note that the table is headed More and Less – because it is all about balance. There is no one food that is all good, or all bad. The third priority is to choose an anti-inflammatory supplement. The American Cancer Institute now recommends 9 portions of fruit and vegetables a day! If this is too much for you, we suggest you switch to a nutritional supplement like NutriShieldthat includes not just the conventional vitamins and minerals, but also potent anti-inflammatory compounds such as Omega 3 fish oil, curcumin, green tea and grapeseed flavonoids. A conventional daily A-Z vitamin and mineral tablet will provide a baseline of the essential micro-nutrients for which there are Recommended Daily Amounts (RDAs), but will do little or nothing to reduce chronic inflammation. This is one reason why studies on simple vitamin and mineral supplements generally show no reduction in age-related disease. Use fewer Omega-6 polyunsaturated plant oils; switch to (mono-unsaturated) olive oil. Cut down on foods cooked at high temperatures, whether grilled, fried, barbecued or roasted, because such cooking creates pro-inflammatory compounds. Rub joints for roasting with thyme and/or oregano which helps counteract these compounds. Meats are best stewed, slow cooked, stir fried or sautéed quickly in thinner cuts. It’s best to steam or microwave vegetables. Do rain and cold affect arthritis pain? 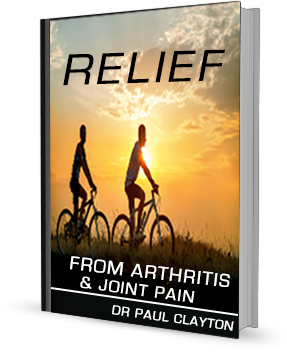 Read Dr Paul Clayton's Introduction to Arthritis on this website free now.